New painting and original available to buy in the gallery 30x30 inches. Not liking this miserable weather all of a sudden!!! Another incredible picture :) Love the colours and the way everything is represented! Hope you like your new sewing machine- I'm really pleased with mine, there is so much choice out there but I'm pretty confident I made the right decision! 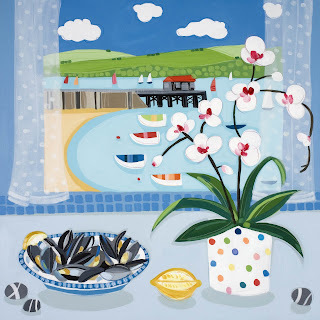 I happened upon your blog by chance through the Attic24 blog (you're on Lucy's blogroll) and I have to say i love your paintings, and by coincidence I bought a number of cards with your prints on from a little gallery in Looe, Cornwall while on holiday a couple of weeks ago, they are beautiful and so cheerful! There are certainly quite a lot of particulars like that to take into consideration. matter, all your points of view happen to be quite exciting. completely convinced of the argument. In any case I did take pleasure in examining it. contribution from people about this article and our own princess is starting to learn so much. Enjoy the remaining portion of the year. Your conducting a useful job. Whats up! I just want to give a huge thumbs up for the great data you have here on this post. Seeking ahead to reading extra from you in a while!